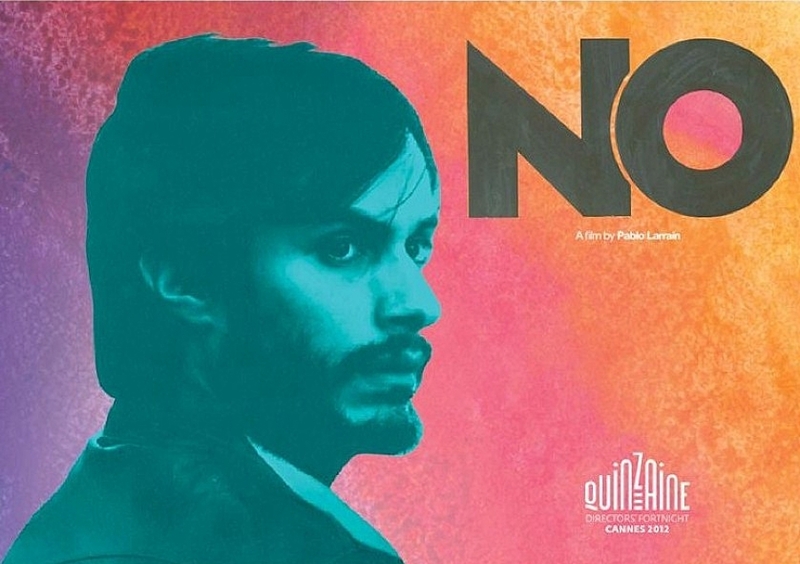 Largely overlooked at this year’s Oscars Pablo Larrain’s “No”, nominated for Best Foreign Language Film, is a slick take on the classic election battle. Simply constructed yet beautifully anchored in its two settings of tumultuous Chile and the 1980’s the film succeeds in creating an engaging narrative on a relatively unknown historical event. “No” is an innovative examination of the powers of modern marketing in changing public opinion in political campaigns. The film centres on happenings of 1988 Chile, where after 16 years of repressive leadership self-elected dictator General Augusto Pinochet, under international pressure, is called into holding referendum to legalise his position. Chile’s population must simply vote either yes for Pinochet to rule for another 8 years or no to end his reign. Indifferent René Saavedra (Gael García Bernal), a successful advertising executive, reluctantly takes up the offer of leading the ‘No’ campaign to oust Pinochet- a man guilty of oppressive leadership involving beatings, executions and torture. Each side is allotted 15 minutes of television advertising time, each day for a month, to lure in the voters. Although the crux of the film is found in the battle between these opposing campaigns there are internal struggles; firstly as Rene struggles to convince conservative politicians of his innovative advertising ideals while Rene is also, on a personal level, dealing with his estranged wife and their young child. Director Larrain’s biggest success in “No” stems from his eye for detail in perfectly recreating a time where microwaves were an exciting new novelty, modern marketing was flourishing and political turmoil was rife. Comparable in its attention to period particulars to “Argo”, yet “No” takes the entirely believable 1980’s Chile a step further by filming in a grainy ¾ inch Sony U-matic magnetic tape which was largely used at the time in the country. The use of this deeply outdated film not only reflects the gritty struggle facing Chile but also sets the film in a frame that means it could possibly be conceived as documentary of events at the time, providing another layer of realism. “No” had potential to not only drag on but also be a mundane journey, due to the nature of the story, yet the film manages to avoid these pitfalls with consummate ease. Paced to perfection, tensions escalate as the campaign swings back and forth combined with the introduction of Rene’s rival and boss Lucho Guzmán (Alfredo Castro) taking the reins of the rival ‘Yes’ campaign, adding an extra level of intrigue to proceedings. The film finds a perfect balance between bringing necessary gravitas to make the story believable while being extremely funny and charming. Rene’s ‘No’ adverts are hilariously ridiculous as they mimic those of 80’s America as all involved are singing and dancing in their unbelievably idealistic world. Absurd to everyone but eagle eye marketers, Rene devises the perfect way to make an “attractive product” out of democracy, something that is common practice in this day and age. Rene’s indifference at the political agenda of his job means he treats the advertising campaign as he does his other commercial contracts with Cola companies and television soap operas- simply selling a product, in this case, happiness. Rene unveils his initial advert with the same nonsense rhetoric which he uses for all his work: “What you are going to see now, is in line with the current social context. After all, today, Chile thinks in its future.” Rene’s apathy allows the audience to see events unfold from an objective stand point as he looks upon the campaign from his mind as a marketing craftsman. While we are clearly rooting for ‘No’ throughout it is Rene’s ability to separate personal feelings from what will sell, unlike the politicians, which brings a unique perspective to the narrative. The climax of “No” is greatly aided by the fact that most people who see it will be unaware of the outcome of the referendum meaning that when the campaigns finally finish the audience is left waiting with bated breath. While Larrain does nothing ground breaking with “No” he does all the basics with absolute precision, it’s his direction that breathes life into the story and stops it from stagnating during its 118 minutes. Flawless without breaking any new cinematic boundaries “No” certainly is an enjoyable, stylish and intriguing film that will leave audiences entirely satisfied.